Ok, that title may be a little misleading considering we have been working on our kitchen since September. 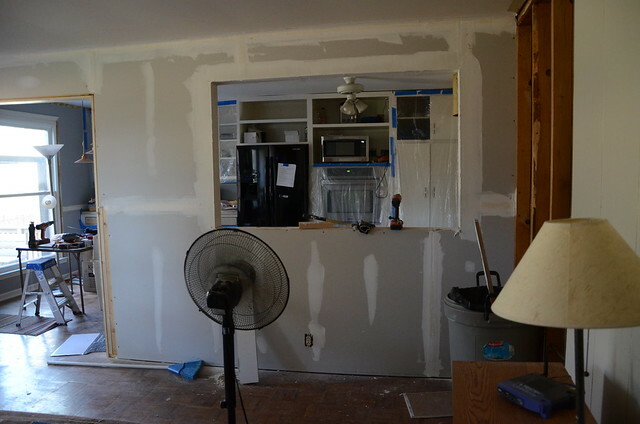 But here is our progress after a week with our contractor. He was able to fix all of the wires that were hung in the soffit. 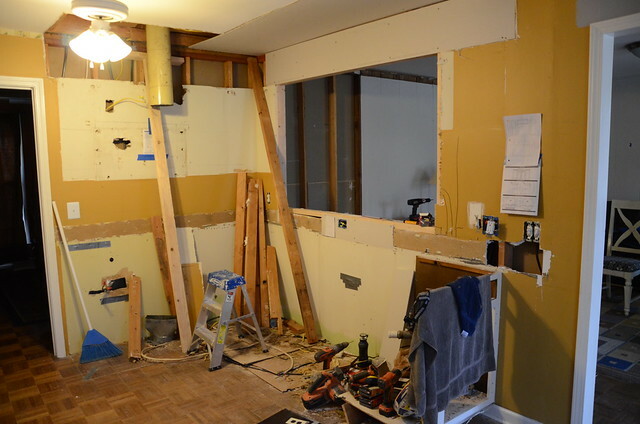 He reinforced the opening and started drywalling. 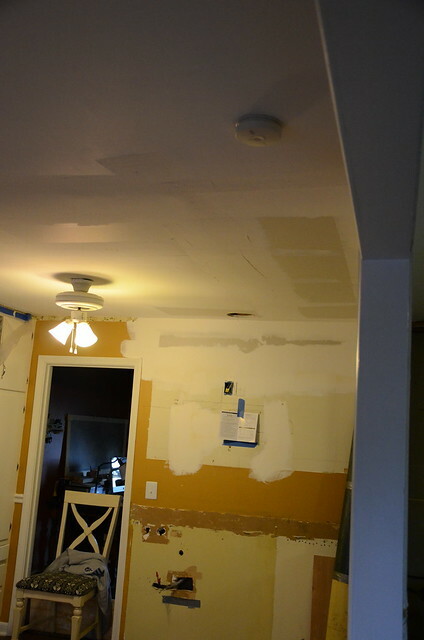 Then he finished up the drywall on both sides and the ceiling. He built our cabinets, which I primed this weekend. This is a glimpse of what we are living in right now. 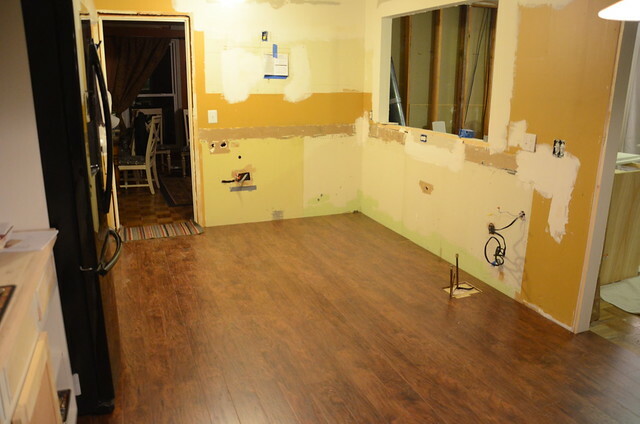 We decided on Wednesday night that we were going to put new flooring in the kitchen. We didn't have enough extra flooring to patch the open areas. We were also concerned that they would not be able to be refinished. They were pretty scratched up. 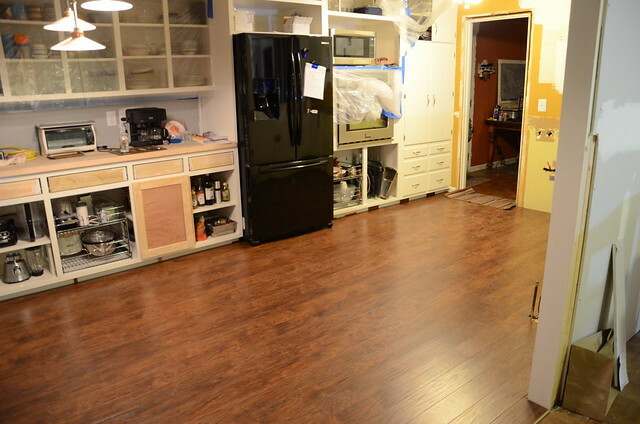 Then when you factor in the sanding and the multiple coats of finish, it just made sense to put down a floating laminate floor. 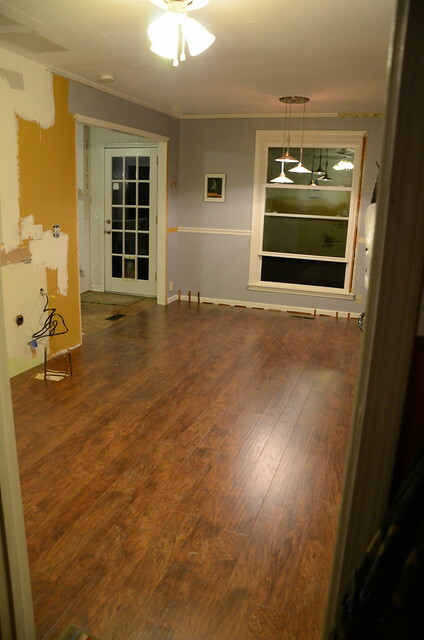 We really wanted real hardwood, but that was going to entail pulling up all of the subfloor. So with the additional expense and work it was going to take, we decided on laminate. 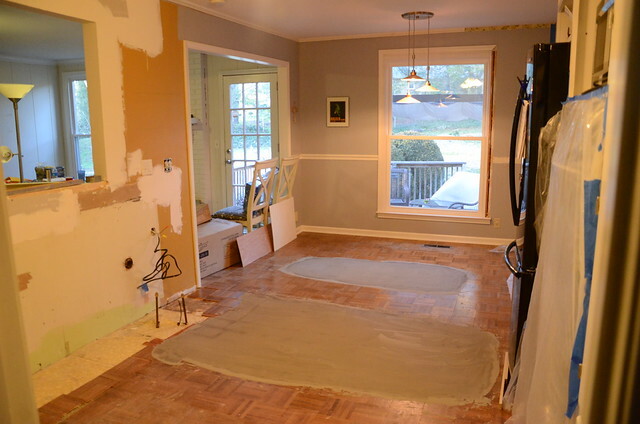 This photo shows the self leveler that Mitch put on the floor. Here's a random photo of the ceiling after 3 coats of mud. 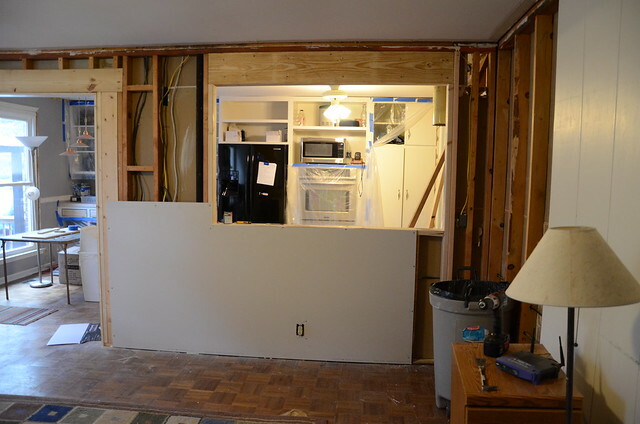 Someone left a comment inquiring about what we did with our existing cabinets. 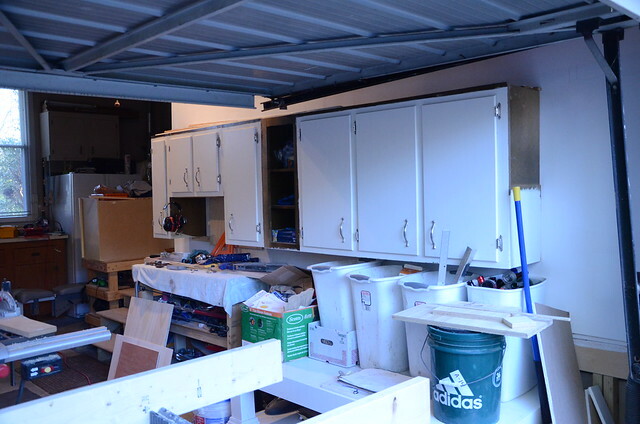 The bottom cabinets were not salvageable, but the upper cabinets found a home in our garage. 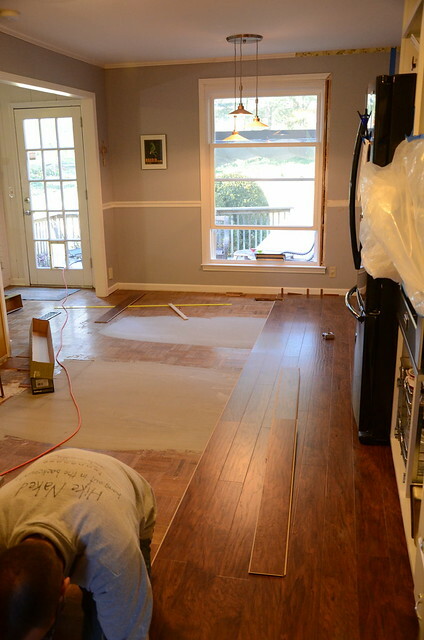 Here's an in progress shot of the floor installation. It took Mitch and I about 5 hours to do the floor. Once we found our groove it went pretty fast. 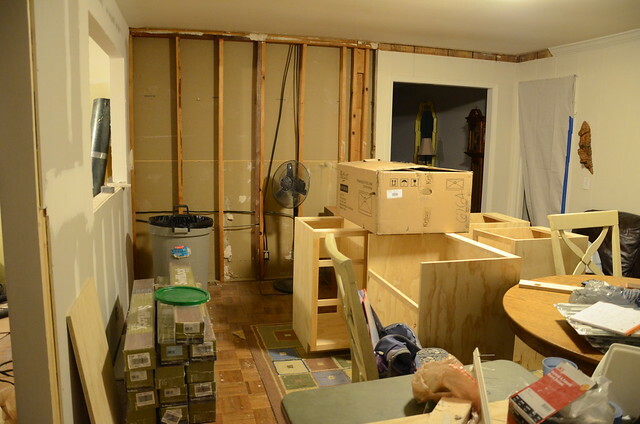 Our contractor is installing the cabinets today. Then he is going to start making all the doors for the cabinets. The countertops are being templated tomorrow. They will be installed next Monday. I will be back tomorrow with photos of our cabinets and tell you about our countertop choice. Wow! That's a lot of stuff. The floor looks great. Have fun with it. The utility sink is often connected directly to the main plumbing line that lead to the sewer or septic system. This is what allows you to dispose of these items in this sink as using a regular home sink would find you having more problems with clogging. 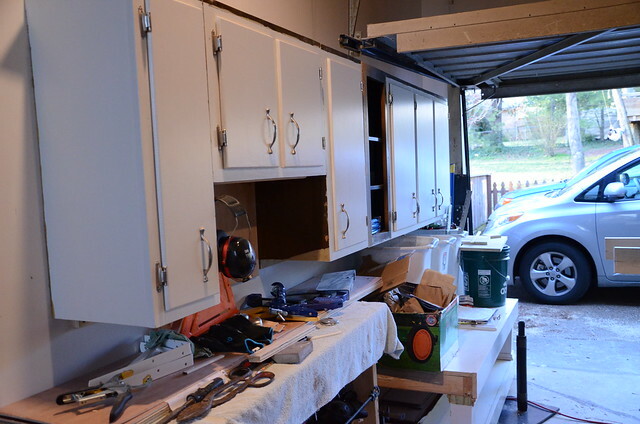 PUtting the cabinets in the garage is a great way to reuse them! You always need storage..pretty much everywhere. I love you garage it looks so simple yet very organized. Thanks and have a nice day. The mood of the room definitely changed, wood panel floors like your are very easy to maintain.